tion of Greater Fort Lauderdale serves them all! 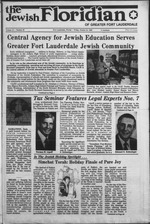 the central address of Jewish education in Greater Fort Lauderdale. the community and recommends those programs that would fulfill those needs. Horowitz, director, Judaica High School and Resource Center. The Challenge Awaits Let's Heed The Call..
of the 19 year old organization. our brethren in Israel and abroad. $300,000 for the '87 campaign. renew a sense of community." Jewish community for a job well done! Nov. 9 CRC Community-Wide program. sion Board Meeting. 10:30 a.m.
Track Program. 7:30 p.m. Speaker: Dr.
Nov. 11 Woodmont Awards Breakfast. Nov. 12-16 General Assembly in Chicago. Ruby Lion Mission to Israel. Nov. 3 Women's Division P.M. Network. Nov. 6 Business Executive Network. Partner in Profile .. .
Israel and around the wor' "
vice and New Gifts Department. to all of our brethren in need." ty of Michigan in Flint. year, it was announced by Max E.
happy and brighten their lives! please contact her at 428-4664.
experience the warmth, the excitement, the miracle of Israel. job. I' 11 just need a little help from the staff. ten-speed and had a spare available just in case. work. Some have even come from the ranks of the volunteers. making innumerable phone calls, and on and on ad infinitum. and events are primarily planned to accommodate volunteers. someone, i. e. staff, was responsible for putting it all together. ment to staff. He just expects that it will all be handled. staff responds and sets the wheels in motion. any criticism, suggest, and then work to get the job done. The writer it a lawyer and campaigner in the Atlanta, Go. JanfaHi Faartalaw Ooaa Ma* OmriiH Keervuth of MarcHanla* AdeerMeed. Federation of Greater Fort Lauderdale. P.O. Box 26610. Tamarac. FL 33320-6910.
other services as well. Dr.
do they all use computers now?). was born, and a cypress for a girl? Do you know what a "wimple" is? of life from a Jewish perspective. series on Thursday, Oct. 30.
who share our Jewish values." riages, divorces, will be explored. She works hard for our ENVIRONMENT..
ment Association. Florida Hospital Cost Containment Board. * Endorsed By Fraternal Order of Police, Dist. 5.
energy to making sure they were passed. Are you aware of the true facts? passed in the 1985 Foreign Aid Bill. International Red Cross to recognize the Magen David Adorn. Senator Paula Hawkins was the deciding vote in Committee to make sure that U.S.
administration when she thought it necessary. She was highly critical of the Presidents visit to Bitburg. day care facilities and extended that coverage to adults supporting older dependents. 48% to her opponents 40%. influence in the White House. Hawkins has been there as a leader in the fight." pressures and has consistently opposed arms sales to States that refuse to make peace with Israel." Perez on one of her visits to Israel. Operation Moses. She proved to be a tough effective fighter." X consumed in the United States are produced abroad. Senator Hawkins mandated that US. w in the fight against drugs. 11 eserved the Office of Juvenile Justice within the Justice Department. d charging their public responsibilities. the Jewish people, Paula has proven she is the one WE CAN TRUST! PCX AD PAID FOP BY THt BMLECT PAIAA HAHWONS FOB OS ! Memories From '66 to '86. JE and for the community. tion's Director of Chaplaincy Service. program chair of the Convention. Adult program at the Soref JCC. JCC Past President, Anita M.
honor Jacob and Peggy Brodzki. Has become many shades of gray. Is now so terribly wrong. Will prevent any undue stress. For your daughter and your son. Are the essence of civilization. Lauderdale, are seen on the city's beach, circa 1920.
ject Team are: Dr. Abraham J. Museum of Florida History, Dept. At the Saturday morning Oct.
operated in Zichron Yaacov. No samples were found. the policies of President Augusto Pinochet of Chile. University of Jerusalem expert on the Soviet legal system states. tyrannical disregard for the law." day 8:46 am. Rabbi Kart F. Stone. Monday through Friday 8:80 am., 6 p.m. Friday late service 8 p.m.; Saturday 9 a.m.
5 p.m.; Sunday 8 a,m., 6 p.m. Rabbi Paul Plotkin. Rabbi Eawitas, Dr. Solo-o. Service. : Sunday through Thursday 8 am., 5:80 p.m.; Friday 8 a.m., 5 p.m., 8 p.m.
Saturday 8:46 a.m., 7:45 p.m. Rabbi Howard A. Addisos, Caator Maurice A. Net. TEMPLE BNAI MOBHE (942-5380), 1434 SE 3rd St, Pompano Beach, 33060. Service. : Friday 8 p.m. Caator Jehadah Heilbraaa. TEMPLE 8HAARAY TZEDEK 741-0296). 4099 Pine Island Rd., Sunrise, 38321.
day 8:45 am., 5 p.m. Rabbi Raadall Koaigsburg. Caator Jack Marehaat. TEMPLE SHOLOM (942-6410), 132 SE 11 Ave Pompano Beach, 33060. Service. 8 ajn., 5 pjn., Saturday 8:46 am., 6 p.m.
Beth Israel in Deerfield Beach. ing from 9 to 11 a.m.
mornings from 9:30 to 11:30 a.m.
and the dynamic spirit of Israel. Israel and throughout the world. Rabbi Albert Schwartz, Federation Chaplaincy director. 748-8400 at the CAJE office. very first lesson, according to Dr. The Torah every year .. The last of Deuteronomy ..
That's what the message is .. .
As Succoth goes away .. .
Be like this joyous day! of Yoav, 14, and Renana, 10.
about their experience in Miami. in an exciting new path. 9 mg. "tar", 0.7 mg. nicotine av. psr cigarette by FTC method. Brian and Claire Steingo, added. dially invited to each celebration. I;: of interest in adult Jewish study. the Temple on Feb. 22.
once a week for 15 weeks. wishing to convert to Judaism. IT COULDN'T BE ANYTHING BUT MAXWELL HOUSE! is about to give birth. million in the U.S. and Canada. People" by Charles E. Silberman. Beach Library 2-3:30 p.m. on Nov.
Thursday Nov. 20 by Dr.
Library on Wednesday, Jan. 21.
and a son, Jay, in San Francisco. So start a new tradition this Shabbos with Ronzoni* No pasta shapes up better. bat Family Dinner. At Temple. Broward: 7 p.m General meeting. tea. Home of Janice Nankin. AJC-Shad Polier Chapter of N.
Gardens Chapter: 9 a.m.-4 p.m.
Federal, 5518 W. Oakland Pk. Chanter: 11:30 a.m. Meeting. Mr.
discussion group at the JCC. to Adele Berman, staff associate. Dinner Dance Sun. Nov. 16.
new sports programs and classes. kind of action for everyone!" pike and 1-95, the clear! sunny! Thursday April 16; Rabbi Kurt F.
1- Who are "Cardiac Jews? 6- What is a "Shtetl"? 8- What does "Naches" imply? ritual, or to give to charity. son" a man among men. Sandra Friedland, director of Kosher Nutrition, 797-0331. Kiddush to usher in the Shabbat. Our Friend Our Neighbor. Our Congressman! America and the Arab countries. av. pei cigarette by FTC method.